Described as one of the toughest triathlons in the world, the Helvellyn Triathlon is no easy undertaking as competitors swim, cycle and run a total of almost 50 miles. We’ve been speaking to competitor, Ceri Norton, to find out more about what’s it’s like to be involved and what it takes to enter. 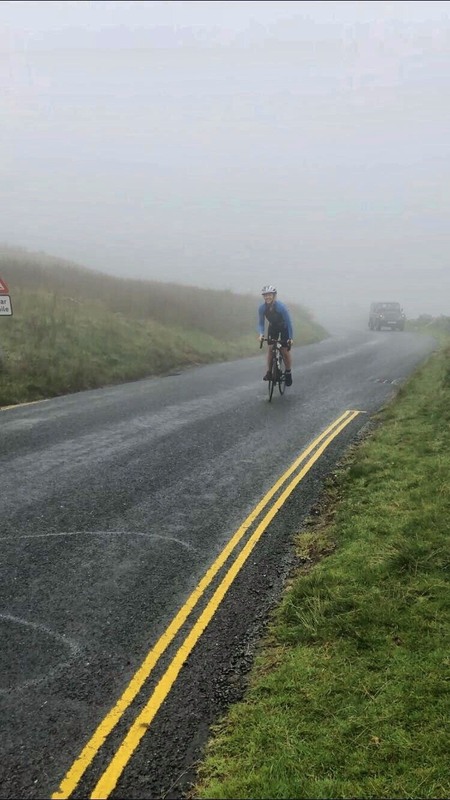 Swimming in beautiful Ullswater, cycling to the top of Kirkstone pass and climbing Helvellyn all seem like very idyllic activities but, do them back to back under a timed environment and you have a cocktail for the ultimate endurance race. Ceri’s race was one of a particularly grueling nature, and an incredible test of character - but more on this shortly. Before competing, Ceri had planned to climb Helvellyn many times but these had never quite materialised. However that all changed when she saw the event advertised and, following the completion of her first triathlon earlier in the year, she ‘couldn’t resist’ entering. The earlier triathlon had only been a sprint version of the multi-discipline event but Ceri did have some previous long-distance conquests under her belt having run in the Snowdonia Ultra Marathon as well as two standard marathons in Australia - Sydney and the Great Ocean Road. In the week before the event she made sure to drink lots of water, have plenty of sleep, and stay positive. For the day itself Ceri invested in both energy gels and hydro tablets and carried her fluids in a camel backpack. She also ran with waterproofs, a bivvy blanket (for emergencies) and a map. After a quick, 26 minute, one mile swim Ceri’s race took a turn for the worse when her bike suffered potentially race-ending damage.. ‘I had no way of fixing this as it was irrepairable without parts. I had no phone and no way to contact anybody for help’. Other competitors were unable to stop and help and she knew her boyfriend would have avoided the main cycling roads and therefore was alone and extremely upset with the situation. In a turn of complete luck though, as she sat on the roadside staring defeat in the face, her sister passed in the car - only five minutes or so later. With some quick thinking, she got in touch with the nearest bike shop (more than ten miles away in neighbouring Keswick) and arranged to pick up a bike. She then drove there and back, delivering the new bike to Ceri just ninety minutes after the initial damage took place. This effort galvanised Ceri in to action: ‘I felt motivated and had changed my mindset, I wanted to desperately complete the course, even if I was now in last place and on a completely unfamiliar bike’. The new bike didn’t have pedals for her clip-in shoes so she had to ride in socks until her boyfriend lent her his shoes. She then rode for the next 33 miles in his oversized footwear before being able to replace them at the final changeover before the run. We can only imagine how much strength of will was needed to continue through that cycle on an unfamiliar bike, in men’s shoes and so far behind all the other competitors. This adversity again gave Ceri a renewed sense of purpose though and a desire to complete the course. Her race didn’t just involve a physical battle but a great mental battle too, in her words, ‘I was very emotional at the end because of this obstacle and challenge, it challenged me in a whole new way, rather than physical, it all became about mental strength and power’. 1. If it scares and excites you at the same time, just do it! 2. Make sure you keep a positive mindset and spend time visualising your finish, the mind is the strongest part of all. 3. Invest in equipment which will support you. Ceri tells us she will definitely be back to do this event next year, ‘without mishaps this time!! !’ And, of course, we can’t wait to see how she gets on! She also has plans to compete in an Ironman and has her sites set on the Tenby Triathlon. You can follow Ceri on her journey on her Instagram. Sign up to our newsletter and we’ll notify you about future posts as well as new product releases too - like our new A/W range dropping this weekend (sneak peak below)!